Source One brand helps mobilizing quality pool of resources to join on contract and contract to hire positions. Source One has created a team to protect the efforts and investment made while delivering recruitment. After recession it was noticed that organization can grow by 30% more without extra investment and efforts if investment and efforts are utilized properly and protected and used and re-used for the growth. Infrastructure and Resources: Planned multilocations and multi modules processes with backup plan to keep consistent work flow on committed business recursions. Key Recruiters and leaders on work: Planned multiple team at a single delivery at one time to commit desired result on time without any failure. Bandwidth usability: Matured forecast systems and strong re-deployment ability and execution to use all critical resources and processes effectively to keep organization daily productivity intact. Holding Brand Equity : Constant in touch with marketplace and customers reduce any such threat to overcome any future hidden business loss and threat. Blocking sold market pool: Run on solid process to keep strong awareness about customers and protect pool from any competitive threat in market to give competitive advantage to customers and retain sold talents and business. 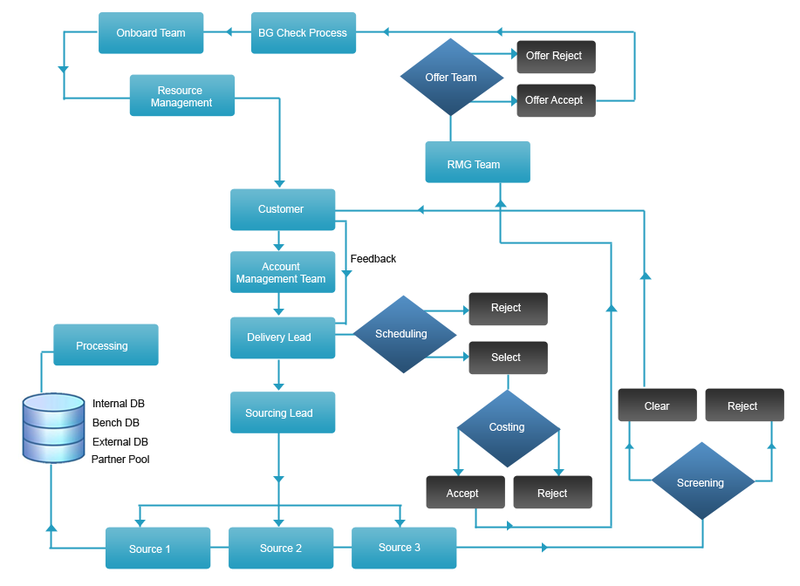 Process Breakdown: Planned multi modules to work at backend hidden process on every front delivery force and team to sustain any invisible performance threat and commit delivery. Change Management: quick roll out plan and education help complete work force to align as per customers' process change and deliver without any breakdown. Reduce Dependency: Planned resources with minimum dependency on any external vendors or process to run internal process effectively and produce desired result. Any hidden threat: Constant watch on every element of delivery at micro level by our key people and management help smooth working of every process and avoid any hidden threat. 1. Central Jobs.guru Database systems: help recovery of any critical information on candidates even one recruiter leaves and computer breakdown. 2. Multilocations email download: Help re-storing critical information and use them ontime without any systems or human error breakdown. 3. Multilocation offices in same city: with three offices at Bangalore and other city like Delhi, help us re-storing any critical resources without loosing any time. 4. Quick Resource deployment: Large bandwidth and multi process running in parallel helps to re-strong any delivery or process in case of one failure. 5.Multi vendor for connectivity: Help running process at different connectivity in case of one vendor's failure like internet, phone etc. 6. 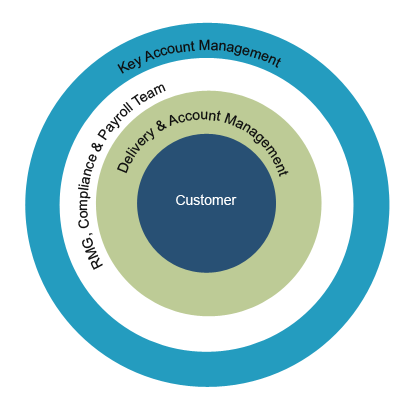 Customer's systems and process breakdown: plan helps quick deployment of key resources at other delivery and re-deployment model helps quick alignment of resources. Its possible by multitasking ability and by creating subject matter expertise across our key resources to be ready for any critical processes anytime. 7. Market watch and escalation mechanism: Easy reach to the management and management active participation at ground level market place helps re-strong any such breakdown due to competition anti-selling and any escalation which comes on way. 8. Resources mobility and transportation: re-store quickly and deploy resources at floor with internal backup plan and strategy. Source One will not use forced or involuntary labor of any type (e.g., forced, bonded, indentured or involuntary prison labor); employment is voluntary. Source One shall respect the legal rights of employees to join or to refrain from joining worker organizations, including trade unions. Suppliers have the right to establish favorable employment conditions and to maintain effective employee communication programs as a means of promoting positive employee relations that make employees view third-party representation as unnecessary. Source One will comply with all applicable laws and regulations in all locations where they conduct business. Change Management, any hidden and unseen threat, forecast and any kind of process breakdown and recovery: Sanjay Anand sanjay@msourceone.com. People Audit Team: Nirmala and Sanjay: In recession Industry has removed uncultured and uner-performance people and team works to safeguard its business from such people hiring in company. Management and the Supervisors have review meeting as per the agenda. Every three months, depending upon the review of every 3 months we make the necessary changes as required. 6. Food and catering, water and Tea vendor.